After yesterday's incredibly mixed manufacturing survey data, today's Services sector data was just as Schizophrenic. 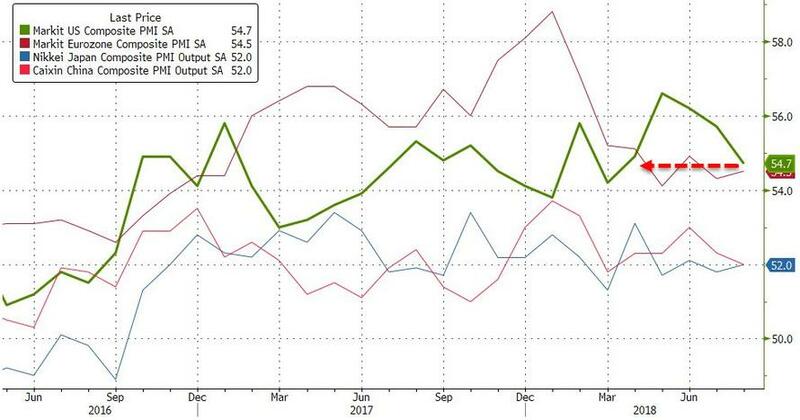 Markit's Services Sector PMI survey missed expectations and dropped to 4-month lows as output, new orders, and employment growth all slowed notably. Although still solid, Markit's PMI suggests the rate of job creation dipped to a seven-month low in August. Firms commonly reported difficulties finding suitable candidates, while greater business requirements and a sustained rise in new orders led many to increase employment. Input prices paid by service sector firms continued to increase at a strong rate in August. The pace of inflation nonetheless softened to a five-month low. 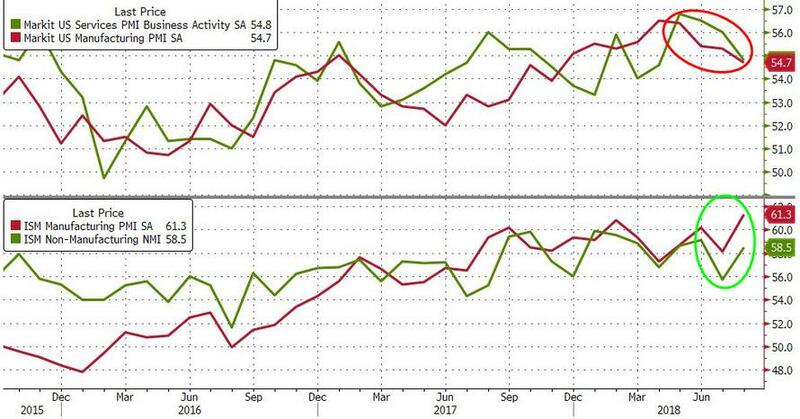 ISM's Services Sector survey tumbled in July and expectations were for a big rebound in August, and it did from 55.7 to 58.5 (just like its manufacturing cousin). 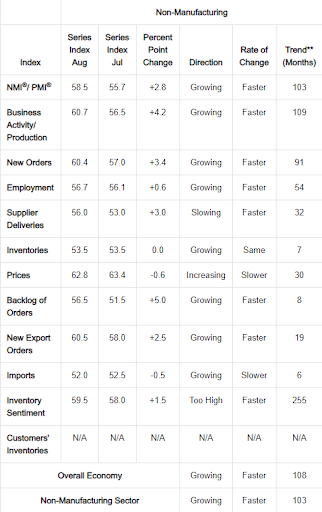 New Orders accelerated according to ISM (slowed per PMI), Employment rose according to ISM (slowed according to PMI), and Export Orders soared according to ISM (slowed according to PMI). 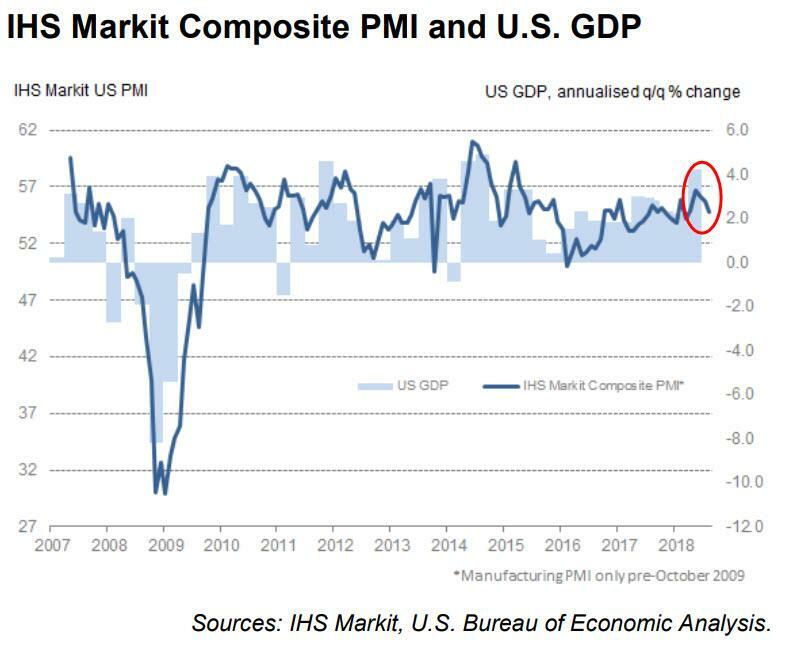 “The weaker PMI numbers indicate that the third quarter is unlikely to see the pace of economic growth match the 4.2% clip seen in the second quarter, though it’s clear that domestic demand remains strong, helping companies raise prices at a near-record rate. “The survey data so far for the third quarter signal annualised GDP growth of just under 3.0%. However, further momentum was lost in August, and the weakest rise in new orders for goods and services for eight months suggests growth could wane further in September. “Similarly, while the survey employment readings remain roughly consistent with a non-farm payroll gain of just under 200,000, the rate of job creation may likewise start to slow. Backlogs of work barely rose for a second successive month in August, indicating that existing operating capacity levels are broadly sufficient to cope with current demand growth.